Why Is It Such a Controversy to Start the School Day at 9am in South Korea? 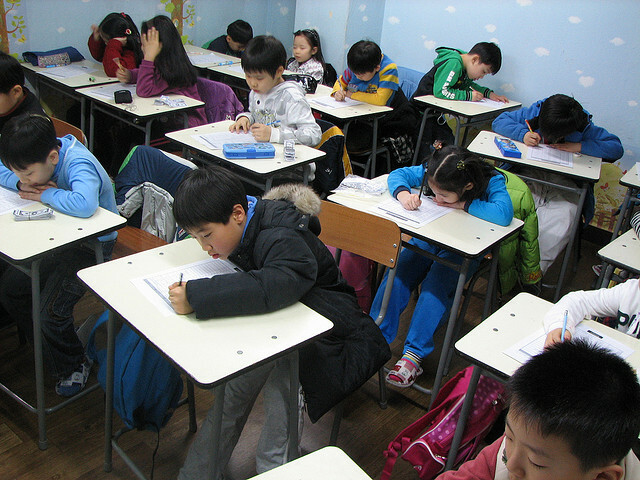 Young Korean children studying at a “hagwon.” Image by Flickr user knittymarie. CC BY-SA 2.0. South Korea is notorious for its highly competitive and grueling education system, which forces young children to study from early in the morning until late at night. The official school day runs from just 8am until 4pm, but students typically leave campus for “hagwons,” private tutoring institutes, where they continue studying until late at night (and sometimes even into the morning hours). In mid-August, South Korea's Gyeonggi Province decided to delay the start of the school day by one hour, hoping to allow children more sleep. This new “9am late-start system” has provoked a nationwide debate, and several other provinces are now considering similar policies. The response online has been divided. Some Koreans say the “reform” merely restores school hours that used to be in place. Others have expressed concerns that over-zealous parents will still find ways to abuse the news system, presumably by finding new tutoring in the early morning hours. Those people who call the 9am late-start system a controversy — it's like watching drivers who go over 100km per hour on the highway criticize the sane ones who drive under the 100km/h limit, calling THEM crazy. Both posts below have attracted more than 1,300 retweets. What gives me goosebumps are these soccer moms chatting about the 9am late-start system. I overheard them talking, all giggling, that the late-start might undermine effective studying. Now they will wake them up before 7am and put them to work on their prep books or something. They are insane. Actually there are many kids who oppose the 9am system, as it would likely push regular school hours later, cutting into students’ already limited free time. When schools switched from a 6-day school week to a 5-day week, for instance, vacation times shrunk, because the number of mandatory total school days remained high. The total number of mandatory school days is what needs to be reduced. The controversy about the later start time isn't entirely about students’ wellbeing, of course. Many of the worries have more to do with parents’ work schedules than children's studying. Indeed, according to one survey, over 73 percent of students like the new change, while only 56 percent parents are in favor. I fully understand that double-income parents have a hard time adjusting to the 9am system. But I was left a bit perplexed, watching a mother on the morning news tell reporters that she opposes the new system “because she works.” She could have demanded that schools find something else for kids to do before the school day, but opposing it just because it's inconvenient is ridiculous.